Into Africa tells the story of a novice motorcyclist who takes on the challenge of riding the length of the continent just because, 'it seemed like a great idea’. Sam Manicom had only planned to take a temporary break from his successful retail career, but the one-year ride was so life-changing that he continued adventuring around the world for another seven years, covering 55 countries and 200,000 miles. Sam had no idea how liberating motorcycle travel would be. Revelling in a new-found freedom without timetables or routines, he became fascinated by his ability to explore side roads at a whim and reach remote parts of the continent that many travellers never find. Though Africa is just 5,000 miles from top to toe, Sam explored over 22,000 miles on every kind of road imaginable. Would you consider the audio edition of Into Africa to be better than the print version? I very much enjoyed the print version. The audio version which is in fact narrated by the author gave me the feel of a friend telling me a story of far off travels and the good and bad that can be experienced on such a journey. What other book might you compare Into Africa to and why? Ted Simon's Jupiter's Travels is similar in that it is adventure travel by motorcycle. Have you listened to any of Sam Manicom’s other performances before? How does this one compare? This was my first and I thought is was fantastic. Yes, this would be a great way to spend a relaxing day. I really like the way the narration gives a bit of a pause (musically) between chapters. It gave me a feel for the cultural adventure which lay ahead. For anyone who has ever considered dropping everything and traveling the world. This book will give you the feel and flavor for such an adventure and the reality of what such an adventure could entail. Having spent over 5 years in Africa working at various U. S. Embassies, this audio book stuck a heart felt cord with me. Sam's descriptive abilities puts you right into the adventure and I can vouch for his accuracy. This story is not about motorcycles, but shows what the real Africa is like, which can only be experienced by motorcycle. Read or hear this book. You will be enlightened. Into Africa is a brilliant tale told by the author himself. The sense of adventure is sharpened by hearing it told by the same individual who experienced it. You can sense how the trip effected him on a personal level, as I'm sure it would have effected virtually all of us. The crackling sound of a campfire would have made you believe you were there, with him, hearing the stories first hand. Exceptional descriptions paint a picture of these strange and exotic locations. The listener feels themselves being transformed by the adventure, and comes away with a new perspective on this remarkable continent. I truly enjoyed the audio format of this great book. For those who have not been able to travel far and wide, sit back and enjoy taking part in a fantastic adventure to another world. 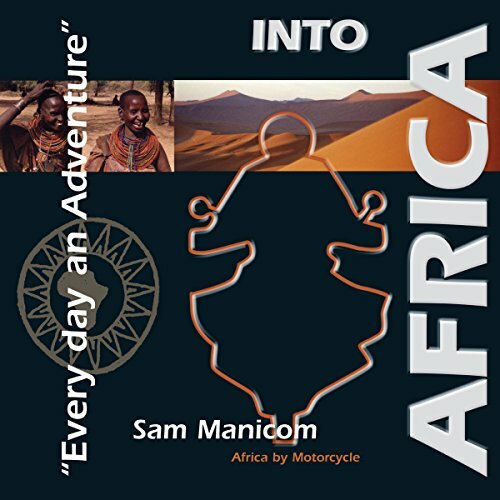 I met Sam at the AIMExpo and after meeting him I had to hear more of his story and it did not disappoint, THIS Book will make you want to get out on your own rideing adventure! cant wait to listen to the rest of his books . Sam, thank you for the journey. I took solace in the fact that, since you were reading the book to me, you made it through Africa in one piece. But there were many points when I wasn’t sure you would. That said, you (and Libby) brought the magic of Africa and it’s peoples to life in a powerful way. Great story of adventure, misfortune, and mishap! Narrated by the author which helps convey the emotions he felt during this exciting trip. Excellent voice and spoken with great clarity! Can't recommend enough! Would you listen to Into Africa again? Why? I don't tend to listen to stories all over... But I found it an interesting travel story, loaded with adventure and background information. I could almost feel sitting on the bike myself. Made me more positive about Africa. What about Sam Manicom’s performance did you like? It's very well read, good intonation and easy to understand. Excellent Story For the Adventure Junkie in All of Us! I love that the book is narrated by the author. A first person account seems way mor authentic. Well done! incredible story about adventures on BMW Pre GS model thru africa continet in very interesting post african wars time and aparteide. Was hat Ihnen das Hörerlebnis von Into Africa besonders unterhaltsam gemacht? Sam Manicom has a writing style that reminded me of Ted Simon. Down to earth, always more interested to learn about the land and their people than just ticking off another box of the countries visited. Let it inspire you to challenge your own comfort zone. And, by the way, writing a book afterwards is optional !